For the second straight year, the Firefighters showed impressive mettle to win the Ketchum Coed Softball League title. There could be a rivalry brewing in this mountain town's softball league. In a rematch from last year's nail-biting championship game, the Firefighters found themselves facing off against familiar foes Lefty's Bar & Grill. In a double-elimination tournament, the No. 3 seeded Firefighters won by beating Lefty's, 14-6, in the tournament's final game. The Firefighters supplied timely hitting in the final game as Morgan Uhrig cleaned up the tournament's Best Hitter award by going 4 for 4 with two doubles and four runs. He ended up with an .867 batting average throughout the tournament. On the female side, Karley Maratea won Best Hitter award for a female for the Firefighters by hitting .530 in the tournament. "It was good to come back with these guys," said Uhrig, who had been on the 2011 title team. "We knew that we could beat [Lefty's] and we just stuck to it." Uhrig was a tough out in the title game as three of his hits were to the opposite field. These two teams fought back and forth throughout the tournament, meeting three times over last weekend's games. While the Firefighters got the Best Hitter awards for Uhrig and Maratea, Lefty's got the MVP trophies. Kenny Nelson got the men's (.800, 3 home runs) and Wendy Speth (.411) was named for the women. "It was a good season," Nelson said. "We played every game tough." Their first meeting was in the semi-final game where the Firefighters narrowly beat Lefty's 21-19 off a Steve McCoy walk-off home run to end the game. Down three runs with two runners on base in the bottom of the seventh inning, McCoy's only at-bat won the game and kept the tournament alive for the Firefighters. The game went back and forth, just like their meetings. Lefty's opened the first inning with five runs, then the Firefighters answered with seven. The loss sent Lefty's to the loser's bracket where they met and beat Main Street Market/Starbucks/B&B Italia in eight innings of play, 15-14. With the game tied, Lefty's Jeff Burrell scored the winning run from second base when Shanell Nelson hit a walk-off single to win the game. Dave Hausman and Anthony Anderson (2009 MVP) both had four hits in the game with a home run each. MJ Musselman also had four hits. Lefty's found itself down for much of the game by only putting two runs on the board through four innings, but a big fifth inning put Lefty's back in business. Hausman, Anderson, Musselman and Nelson all got on base and eventually scored in the fifth inning. The sixth and seventh innings saw similar result as Lefty's found its groove just in time for a late-game rally. The win put Lefty's back in the winner's circle for a rematch for the title. Because the tournament was double-elimination, Lefty's found itself in the championship game against the Firefighters. Winners of the 2009 title as a No. 2 seed when they beat Casino, Lefty's has a champion's experience. In the rematch, Lefty's came out of the gate firing on all cylinders with a barrage of hitting to put the Firefighters in a hole instantly. Lefty's put the Firefighters out of game 1 in the title game easily, 22-10. Lefty's started the game with a triple by Hausman, who would later score in the inning. Lefty's put the game out of reach early by putting up 10 runs in the first inning, which included a grand slam by Jeff Burrell. Burrell finished the day with six RBIs. Lefty's kept tallying up runs by putting seven more in the second inning before making it a one-sided contest. Lefty's Musselman and Kenny Nelson had two hits and three runs each. Anderson had three hits and four runs. However, in the second title game, the Firefighters regained their composure. Lefty's hitting all of a sudden went cold as they spent all of their runs in the first game. The Firefighters would prove they had what it takes to win the whole tournament by silencing Lefty's for good. Uhrig's hitting was easily the cornerstone of the second game's win for the Firefighters, but there were other key ingredients, too. As the hitting faltered for Lefty's, the Firefighters' defense picked up with impressive plays in the outfield and in the dirt. Lefty's usually has quite a bit of power, but only scored one home run in the second game. The Firefighters' Sara Benson had an outstanding title game as she had three hits in the game. "We built on a strong seventh inning in the first game," Benson said. "Holding (Lefty's) to one home run was huge. It was a great season, good competition." Matt Christian (2011 MVP) had four hits and two runs, Brian Burrell had three hits and two runs. Keith Potter and John Rathfon also had two hits. Find more photos in the Aug. 8 Local Life section of the newspaper. 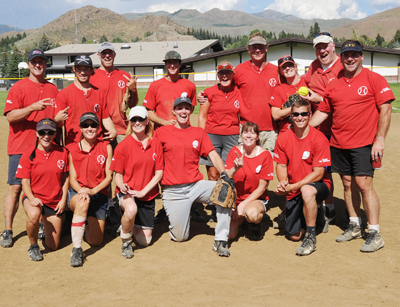 KETCHUM COED NOTES—This year's Ketchum Coed Softball League tournament scoring took a significant increase from last summer from 24.2 combined runs per game to a staggering 27.8 this year. Last year's 10 combined runs paled in comparison to this year's title game of 20. This was the 23rd season for the Ketchum league, which Lefty's first entered in 1994 and the Firefighters in 1998. The first six teams in the league when it started in 1990 were Blaine County Title, Mountain Time/Sage Bluebirds, Coors, Carpet Sharks, Whiskey Jacques'/Saltwater Grill and Budweiser/Mountain Express. The Firefighters and Lefty's only met once during the regular season, but met three times during the tournament for a total of four times this season as both teams split games. The Firefighters may have won the tournament, but Lefty's outscored the Firefighters 56-51 in those games.